Sue Guiney's new novel A Clash of Innocents (Ward Wood £8.99) was released last month and to mark the occasion I subjected Sue to an interrogation some friendly questioning about the book, her writing, inspiration, family life an just about anything else I thought might be interesting. I do love talking to and reading about writers, especially 'proper' writers like Sue. I'm doing another OU writing course at the moment and I find almost any discussion of the writer's craft helpful and revealing. I don't know about you, but when I read an author interview, or listen to one on the radio or (rarely) see one on the television I always want to ask a different questions to the interviewer. So getting a chance to ask them of a writer of Sue's calibre was too good an opportunity to miss. I began by asking Sue about her family, and how she went about juggling the demands of writing with the demands of family life? I love this question because it gives me a chance to look in the rearview mirror, so to speak. I have 2 sons, 26 and 19 (yes, it really does happen). Neither of them live at home now, and that has been an incredible and sometimes painful shift. When the kids were little, I would look at my diary every Sunday to see what my upcoming week looked like – the usual chores of parenthood like doctor appointments, school meetings, errands etc. Then I would try to find morning blocks of time that weren’t already scheduled that I could devote to writing. I could always find one. Sometimes there were two mornings in a week, rarely three. But the fact that they were so difficult to come up with made them even more precious, so writing was never hard. It was always the secret thing I did for myself. Sure, if something important to the family came up to interfere with my writing time (don’t even get me started on school holidays) I would have to give up the writing slot. But just the act of trying to schedule it in gave it an importance in my life which, I believe, is crucial if you want to write. Writing is not easy. And so you have to say out loud to yourself – first and foremost – this is what I choose to do with my time and outside of my family, it must take priority. Now, once I became an “empty nester” last year I found that I had time like I’d never had before and so now it seems all I do is work, creatively when I can or, like now, the business of writing such as promoting your work. I’ve also learned that you can’t successfully have one without the other. What I haven’t learned to do very successfully yet is balance. From a question about scheduling family and writing time I wondered whether Sue ever found inspiration in the things her family said or did. Did dinner table dialogue ever get a direct transfer to the page? Do I have to be honest? Of course, I do. Okay, the answer is yes. Sometimes real life is just too good not to turn it into fiction, and some specific experiences I had did end up in the book. I won’t tell you all, but I will tell you one – the scene where the young American volunteer tried to participate in the children’s Khmer Traditional Dance class. I myself tried that – much to the hilarity of the kids themselves. It was just too good a scene not to include it. But I will say that although I might cannibalize my own life for my art, I won’t cannibalize others. And no character is ever taken whole cloth from any individual I might know. My characters are amalgams of people I’ve met or imagined over the years. This is fiction, after all. 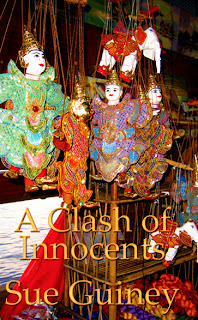 Having referred to the fact that 'A Clash of Innocents' is at least partly set in Cambodia, and knowing that Sue and her family spent time there some years ago I thought it would be interesting to find out more about what was clearly an important time. We went to Cambodia with my younger son who was 15 at the time. None of us had ever been to Asia before and it was by far the most exciting trip we had ever planned. Unfortunately, our older son was in the middle of his drama school course and couldn’t come with us, and that was hard too, namely that there was an important experience that the rest of us shared without him. But it was a difficult trip in many ways. Our accommodation and transport around Cambodia were far from deluxe. We were there with other families working in an orphanage and then building houses among one of the poorest communities. Everywhere there was poverty, disease, and even danger. This was definitely not a trip for the squeamish. In some ways, if the kids with us were younger it would have been easier. Sometimes younger kids have a greater ability to just muck in. Teenagers have needs that can’t always be fixed with a sweetie. But that was one of the reasons why the trip was so important. We all got to learn about some harsh realities of life together. We helped each other and our own lives changed because of it. But they changed together and that was a great gift – especially to the parents, I think. At least it was to me. Finally - and knowing Sue is a musician - I asked her the kind of question nobody ever ask a writer, but to which I always want to know the answer, namely whether she sometimes find herself thinking more in terms of musical as opposed to literary structures and whether there is anything to be gained as a writer (other than the obvious pleasure) from making music? A fascinating question, Tim. I’m not sure that music has influenced structure all that much, except for the innate sense of building up and denouement, which can be seen to be like a crescendo and decrescendo. But I think music has definitely influenced my ear, especially in poetry but also in prose. Sometimes when editing I find that I miss problems of meaning because I get too lost in the cadence of a sentence. If it sounds good then I want to go with it – even at the cost of sense. Thank goodness for good editors. Yes, music does influence my sense of rhythm and pace. Can you write even if you aren’t musical? Of course, but anything you do in life is always much better if music is a part of it, eh?